OK, we’ve got past Blue Monday, and apparently we’re getting happier. Not just in the past few weeks, but consistently over the last five years. Despite Brexit, terrorism, financial pressures and the state of the NHS, the Office for National Statistics survey of wellbeing in the UK* shows a positive, if gradual, trend over this period. Given the current state of the world, the obvious question is why? I’ve long believed that wellbeing data is more important than the economic indicators we hear so much about. But the numbers are only useful if we understand what influences them, and what we can do about it. Moreover, it’s not just the average that matters, but levels of wellbeing inequality and the consequences of this. One major research source on this is the What Works Centre for Wellbeing (https://www.whatworkswellbeing.org). 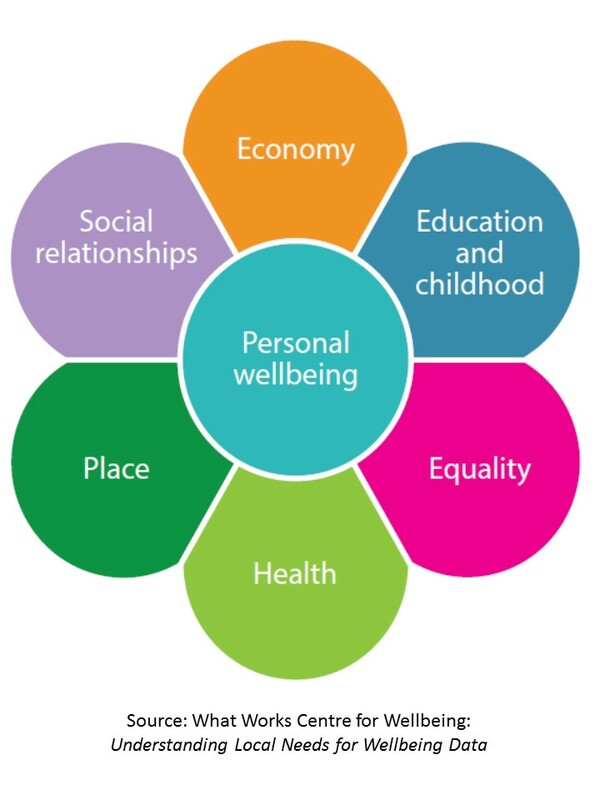 One of its many papers proposes a Local Wellbeing indicator set based around seven domains**, each comprising several measures. Alongside this, it has produced local wellbeing data for all Local Authorities in England, using these indicators***. This is ‘work in progress’ though, particularly because it relies on indicators that are currently available rather than what we should ideally be measuring. For public and third sector organisations, this approach has implications if we are trying to measure outcomes from a specific activity or intervention. Wellbeing measures such as the Warwick-Edinburgh Mental Well-Being Scale (WEMWEBS) and Outcomes Stars™ can indicate changes in people’s wellbeing, but need further study to understand what causes these. We don’t automatically know to what extent any specific intervention influences a person’s overall ‘life satisfaction’. 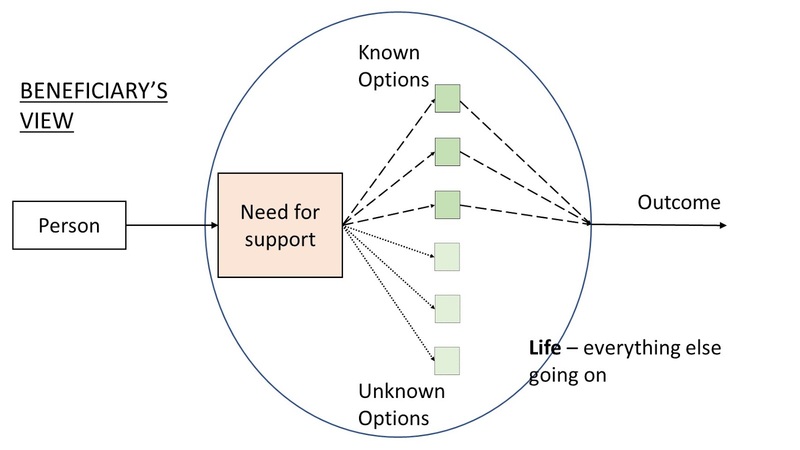 Part of my diagram from my earlier blog (June 2017) illustrates this from a service user perspective. So, what can we do about this in practice? Well, I believe that what we have is a type of ‘nudge’ (google ‘Nudge Theory’ if you’re not sure what I mean). Here, there is no single action that transforms life for disadvantaged people in society, but rather a series of interconnected interventions that help make their life experience more positive. These might for example include counselling or other therapy, medication, financial support, and changes to where they live. We may not be able to assess the precise contribution that each of these elements makes, but we can assess them as all moving in the right direction. 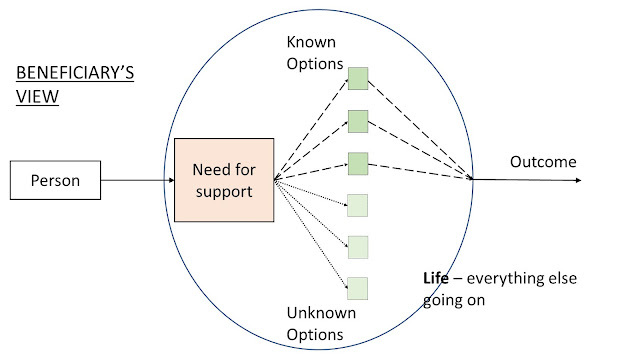 In a perfect world, coordinated support for every individual would be available across all these domains. This isn’t going to happen any time soon however, so more practically we need to avoid one-size-fits-all solutions and make sure diverse ‘nudge’ support options remain open – and publicised – to people who need them. This means exploring, through trial and error if necessary, how different interventions work for different individuals, and being prepared to change. And it means public and third sector organisations working ever more closely together, with the people they serve as their prime focus.